"I think the rules are wrong and they don't do anyone any favours," Townsend told BBC Radio 5 live. 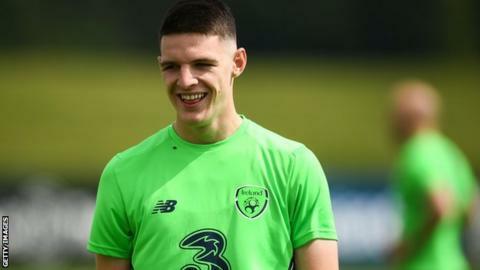 "I do understand that, for many reasons, playing for England would be more significant than playing for Ireland but I think once you have made the decision to play for a team, that should be it and you should get on with it." Rice was born in England but has played for the Republic, his grandparents' country, since under-16 level. "I don't think there is any doubt that over time he will get an opportunity to play for the senior England national team," added Townsend, who was born in England but earned 70 caps for the Republic. "But it's such a shame because I think he is ready now to really go and lead Ireland and propel them forward. "But he's made his call and that's his decision."